Huntsville State Park, located within the rolling hills of Sam Houston National Forest, is part of the East Texas Piney Woods region that marks the western limits of the Southern Pine Belt. In response to the depletion of local natural resources in the early 20th century caused by extensive timber production and the lack of conservation measures, members of CCC Company 1823 reforested the land through plantings of pine, sweet gum, maple, oak, and dogwood. 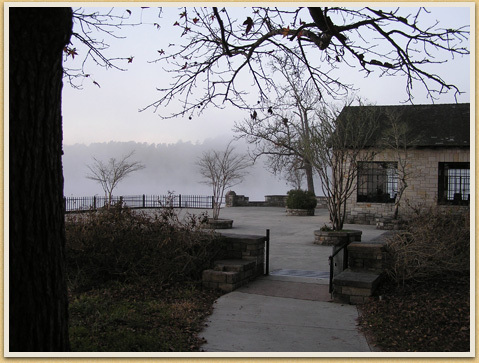 From 1937 to 1942, this seasoned company of African American World War I veterans, who earlier worked at Palmetto, Kerrville, and Abilene State Parks as well as Sweetwater Metropolitan Park, made the initial improvements to the site, including construction of the combination building, the boat house, and the dam and spillway, following the designs of architects Paul E. Pressler, George T. Patrick, and Donald D. Obert. The spillway gave way after a 1940 flood and Lake Raven drained. While this threatened to jeopardize the overall project, work soon continued on key park elements. Supplemental work at the park came through the efforts of two CCC forestry companies—873 and 1827—assigned there between 1933 and 1937 for firefighting and flood control in the area; they also built unpaved roads, including some on parkland. Now largely forested over, these former roads are discernible through culverts and a stone bridge along the Triple C Trail. With the advent of World War II, the CCC’s work ended, but Works Progress Administration workers and prison laborers completed projects that included building roads and water and septic systems, allowing the park to open for limited activities during summer months of the war years. Postwar projects at the park, including reconstruction of the spillway, restoration of the lake, and development of new campsites, shelters, trails, and other amenities, serve to complement the earlier work of the CCC. Earthen Dam, Combination Building (currently the lodge), Boat House, Swimming Platform, Stone Culverts, Picnic Areas, Lakeshore Road, Bridge, Stone Road-Curbing, Well, Water Intake Structure, and Frame Pump House. The proposed Bath House and Cabins were not constructed.